Year after year we keep hearing the importance of web presence for your business. Maybe you have just launched your sign company and need a new site; or you are an established sign printer that’s been in the biz for 20 years. Either way your website is at the forefront of your corporation, and is a key point of contact for new business. Unfortunately, websites are not a “set it and forget it”, marketing tool. Your website content needs to be fresh, relevant and clear; as it is going to be the first impression of your business that the evermore web-savvy consumer is being exposed to. 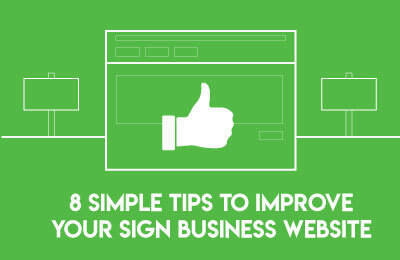 Below you will find 10 quick tips that can greatly improve your sign business website. Be clear and concise. Remember that your customers may have no familiarity with signage our how it is produced. A customer can become easily confused with long and highly detailed paragraphs concerning UV, screen printing processes, PMS colors and DPI. Assist in making visitors first exposure too your business frustration free. For good measure, review your website copy with people outside of your industry too see if it makes simple sense. Clearly say who you are, what you do and why you are good at it. You are not only selling your sign products and services, but you’re selling yourself as well. Build trust with new visitors by letting them get to know you. Clearly spell out your signage capabilities so that visitors can easily identify what you offer. Build value in your services by promoting high quality materials, inks, design capabilities, pricing, or turnaround times. Show who you know. Showcase your customers with a finished product gallery and testimonials. Personal touchpoint examples such as these build visitor trust in your business as they see you play well with others. Social media add-ons help as well as they easily show the user that you are engaged with your customers. Displaying recognized logos of your clients is also an excellent way to build customer trust. Insure security with SSL. A Secure Socket Layer (SSL), is available for websites and provides visitors an encrypted tunnel of communication between them and your site. This encryption protects the data that your website and visitor send back and forth, and is a critical necessity if you are handling any form of online payment transactions. Be sure to display the badge or logo of your SSL provider so that visitors can see it; as this builds consumer trust in your sign business knowing that their personal data is secure. Click here to learn more about SSL. Prompt & provide feedback methods. You’ve started your business, you have a flashy new website that’s up and working– right? Again, our marketing goals are to align our perceptions with that of our customers. So how do we know what they think? We ask! Your website is an excellent touchpoint for customer feedback as they are surfing the web in their own privacy and are more pat to send honest reviews and feedback about your company as they are not confronted with the issue of being cordial by chatting face-to-face. Feedback can be collected via a contact form or survey, but can even be as simple as having a prompt that says “How are we doing?”, followed by an email to submit reviews to. Note that these emails should be received by an unbiased organization member; as some feedback may reflect poor employee performance. Use CTA’s. A Call to Action or CTA is used to direct visitors to the primary functions and intent of your site. Use them sparingly as beacon to direct customers where you want them. Ask yourself “What are the first 1-3 things I want a customer to do when they arrive at my site?”. Do you want to feature a new product or service, highlight a new showroom or highlight your new customer gallery? Call them out with your CTA! Differentiate CTA’s by using accent colors that stand out from the overall theme of your site. They are not just for your homepage either. Again think of a CTA as a series of highlight beacons that you can place to help direct customers where YOU want them to go. Have the answers. Having a Frequently Asked Questions (FAQ), page is an excellent asset that assists in training new potential clients of how your sign business process works. FAQ’s can also eliminate the hours of labor dedicated to answering repetitive questions concerning file setup, turnaround times and more. FAQ’s are also an excellent resource to populate your site with relevant keywords for search engine results. Be contact conscious. Believe it or not, some small business websites don’t have a clear and easy way for customers to connect. Make your contact page easily accessible in your site navigation and insure that it appears on every page within the site. It is also a good idea to provide multiple channels for communication to provide visitors their preferred method of contact including email, phone or date and event times. This entry was posted in Commercial Signage, Digital Printing, Retail Signage, Sign Business, Sign Website Design and tagged ecommerce, sign company, tips, website design.